May | 2014 | Mothers Against Wind Turbines Inc.
“Unite The Fight” Dinner Another Success! 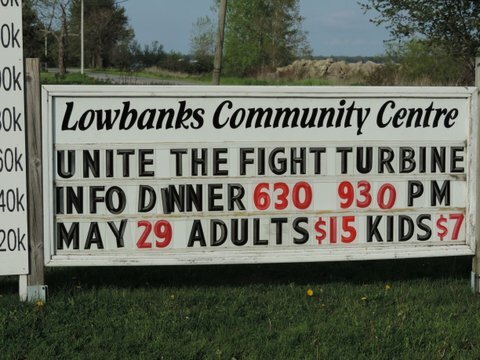 The Mothers Against Wind Turbines hosted another successful dinner and information night in a recent series called “Unite The Fight.” It was held in Haldimand County on the beautiful shores of Lake Erie, at the Lowbanks Community Hall. Great food was served buffet style and the desert table was sinfully tempting. New faces and the meeting of old friends and supporters as the relentless invasion of wind turbines continues in Ontario. multiple deficiencies, its approval remains a real threat. Several members of the Mothers Against Wind Turbines working committees made presentations of activities and actions already undertaken and anticipated next steps. The Trees Not Turbines campaign was underway! 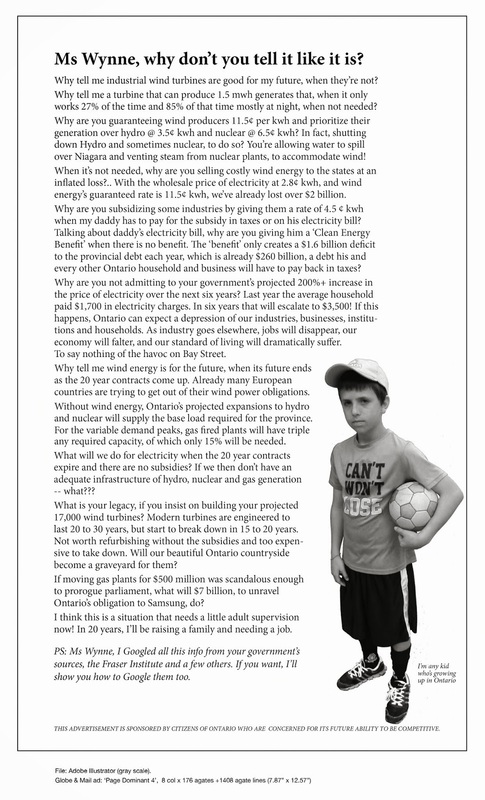 The Mothers Against Wind Turbines Inc have many other events in the works, and next up will a booth at Friday the 13th in Port Dover, and Poultry Fest at the end of June. TONIGHT – Information Night Dinner! We will also be selling White Pine trees for the “Trees Not Turbines” campaign = $3.00 each or 4 for $10! Ontario is at a crossroads and unless we get our financial house in order! The item below was written by one of our very informed and knowledgeable members. She has given us permission to send it to you. Ontario is at a crossroads and unless we get our financial house in order we will all be disadvantaged in the future. Fiscal responsibility demands that those in charge manage the budget. Kathleen Wynne and finance minister Charles Sousa have predicted that the Ontario economy will under-perform the Canadian, American and global economies for the next two DECADES! Consider the performance of the Ontario economy over the last nine years. The province has been put on notice by Standard and Poor, our credit rating has been downgraded, and we are under a very serious credit watch. The provincial deficit for this year is $12.5 billion, so this year alone we are spending $12.5 billion more than the provincial government collected from Personal Income Tax , Sales Tax, Corporations Tax, Ontario Health Premiums, Education Property Tax, All Other Taxes, Government of Canada transfer payments, Income from Government Business Enterprises and Other Non-Tax Revenue. Our Total Provincial Revenue for 2013 was $114.2 billion. Our provincial debt has more than doubled to $288 billion in the last nine years, and servicing this debt is costing us $11.4 billion this year. Interest payments on our debt are the third largest budget expenditure after health and education. Over the past nine years more than 300,000 new provincial government employees have been added to the pay roll. Many of these government employees make more than $100,000 per year and are on the Sunshine List. Over 650 new agencies, boards, commissions and entities such as LHIN’s and CCAC’s have been created. Ontario has a population of 13.5 million people of whom 7.4 million people are in the labour force. Over one million people are on the provincial government pay roll, paid by the tax payers of this province. It is neither desirable nor healthy to have everyone working for the government. The government bureaucracy has ballooned out of proportion to the size of the population and it is time to CUT FROM THE TOP. We do not want to remove classroom teachers, nurses, doctors and the people on the front lines, WE NEED THE BUREAUCRATIC FAT TRRIMMED. We can no longer afford to hire people we do not need, to work in government offices when over half a million Ontarians are now out of work. We are paying more provincial taxes initiated by the Liberals only to receive fewer services. We now pay HST, health premium (tax), WSIB tax increase, tire tax, electronics tax, eco fees, beer surtax, etc . Yet in health care – eye exams have been delisted, physiotherapy has been delisted, chiropractic care has been delisted, diabetic strips have been delisted. We have an increased wait time for cataract surgery because Ontario has cut cataract-surgery funding. As the population ages and the supply remains stagnant the wait time for nursing home beds has tripled. So eventually, only the rich will be able to afford health care and nursing homes. Our manufacturing base is being gutted due to high energy costs. Our energy costs are the highest in North America. We have created an energy surplus since 2006 due to decreased manufacturing and conservation, yet we continue to add renewable energy – wind and solar – to the grid. To maintain a stable grid we pay Quebec and some north-eastern States to take our surplus energy. The closing of the Gas plants in Oakville and Mississauga will cost the tax payers of this province $1.1 billion. However, this will pale in comparison to the cost of the implementation of the Green Energy Act – a $20 billion price tag for FIT contracts to subsidize renewable energy projects for the next twenty years. Meanwhile, the hydro at Niagara Falls is underutilized and we pay to run a second energy system on “spinning standby” to provide base power when the wind does not blow. The renewable energy subsidies are essential to keep this industry going and this will be the biggest transfer of wealth from the middle class to the corporate elite in the history of Ontario. Ontario is a have-not province for the first time in Canadian history. Without accountability, transparency, due diligence, and good governance we are being destroyed from within. We are putting our future at risk and that of our children. It is critical that we get our financial house in order. Like I said, Ontario is a have-not province for the first time in Canadian history. Without accountability, transparency, due diligence, and good governance we are being destroyed from within. We are putting our future at risk and that of our children. It is critical that we get our financial house in order. The opinions expressed here are those of the author and do not necessarily represent Mothers Against Wind Turbines Inc. policy. UNESCO has warned that plans for a wind farm of Dorset’s Jurassic Coast could compromise its status as a World Heritage Site. The organisation has waded into the row over a controversial wind farm, writing an explosive letter to Whitehall outlining serious concerns about the project. UNESCO also stressed that Britain could be in breach of the World Heritage Convention, which dictates that individual countries have a duty to ensure the ‘identification, protection, conservation and presentation’ of their World Heritage Site. The director of UNESCO ends the letter by urging the relevant authorities to take the comments into account when deciding to grant the wind farm permission. Television Premiere of Down Wind on Sun News Network — June 4th at 8 and 11 p.m.
Sun News Network will air the television premiere of the documentary film DOWN WIND on Wednesday, June 4 at 8:00 p.m. ET and 11:00 p.m. ET. DOWN WIND is a tell-all film that deals head on with how Ontario politicians rammed through green energy laws and dashed forward with the installation of thousands of wind turbines across the province’s farmland and countryside. The film exposes how the lights of liberty went out for Ontario citizens deeply opposed to wind turbine projects. It tells the stories of communities torn apart, and the rural warriors now fighting for their rights, health and happiness. Sun News Network host and contributor Rebecca Thompson joined Surge Media Productions to create this passionate, yet alarming story of a flawed attempt to green Ontario’s electricity grid. Go to the original article and vote on the Poll!!! In a study published in the journal Environment and Planning, the Western geography department researchers found people who have raised health concerns and other objections to wind turbines are denigrated, dismissed and ostracized by supporters of the developments in their communities. The treatment only makes the situation worse for individuals with concerns, said associate geography professor Jamie Baxter, one of the study’s authors. “If you get right down to the micro level of the community, life is not good for these people,” Baxter said Wednesday. Health concerns reported by opponents included pain, dizziness, sleep deprivation and loss of balance. The study found the majority of people in both communities supported the existing wind farm projects within the communities — 80% in Port Burwell and a statistically significant lower 63% in nearby Clear Creek. But the researchers said the support was more “pragmatic” than “enthusiastic.” Most in favour said it was simply a “better alternative” than other energy choices. Those opposed were quite emotional, expressing anger, disappointment and frustration. In addition to lowering the rhetoric, the researchers suggested the developers of wind farms could improve support for their projects if the financial benefits of wind farms were shared among households in the vicinity of turbines, not just the landowners with the turbines on their property. In their study, the Western researchers looked at Port Burwell in Elgin County, home to 66 industrial wind turbines, and the Clear Creek area in Norfolk County, about 20 kilometres east, home to 18 turbines. In addition to 152 responses to a questionnaire, the researchers gleaned information from 26 face-to-face interviews. The questionnaires were distributed to people living within two kilometres of a wind turbine, while the face-to-face interviews were with participants within a two-kilometre radius. “I would say that’s not really a surprise,” said Jane Wilson, president of Wind Concerns Ontario, of the study’s findings. Wilson said the dismissive attitude toward opponents of wind farms were set almost at the instant former Ontario premier Dalton McGuinty introduced the Green Energy Act. She said those who have concerns have even had their grip on reality questioned. Original Article: A call for calm | The London Free Press. WAINFLEET — Council wants a second look.